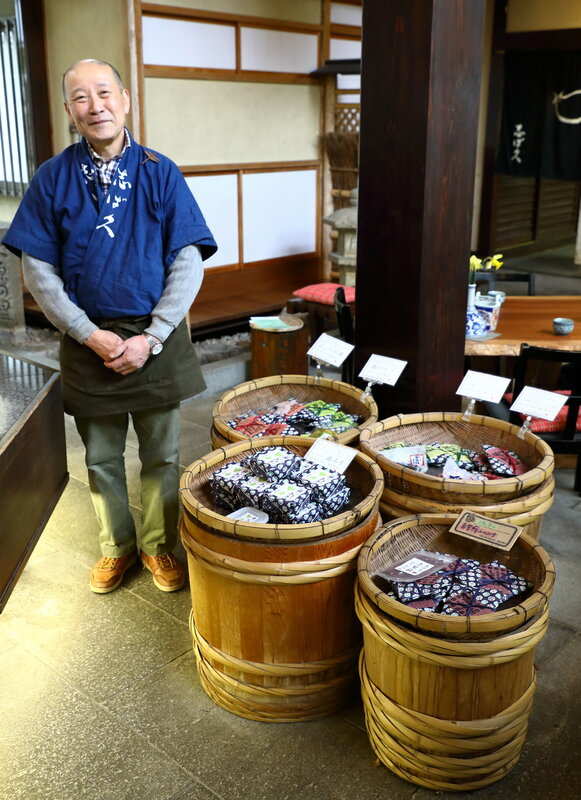 Considered the crown jewel of Kyoto's famous pickles, shibazuke are being made according to a legendary 800-year-old recipe by the Kubo family at Shibakyu in the mountain village of Ohara. Shibazuke are a specialty of Ohara, an ancient rural village and farming community famous for both its vegetables and its pickles. Located in a charming valley in the mountains northeast of Kyoto, Ohara was once considered remote and isolated, but today it is less than an hour by bus from downtown Kyoto. Still, it is the proverbial “a world away." Reached by a winding road that climbs through the foothills of Mount Hiei, the sacred mountain that looms over Kyoto, Ohara is full of soothing sounds from the water flowing in its many rivers, streams, and waterfalls, cooling breezes emanating from its shady forests, and rich earthy smells from the fertile soil of its extensive fields. It is an excellent place to grow kyo-yasai, the heirloom vegetables of Kyoto that are famous for their vivid colors, unique shapes, and robust nutrients. Ohara is also an excellent place to preserve them because the area’s generally cool climate and pure mountain air are conducive to healthy and flavorful fermentation nearly all year round. 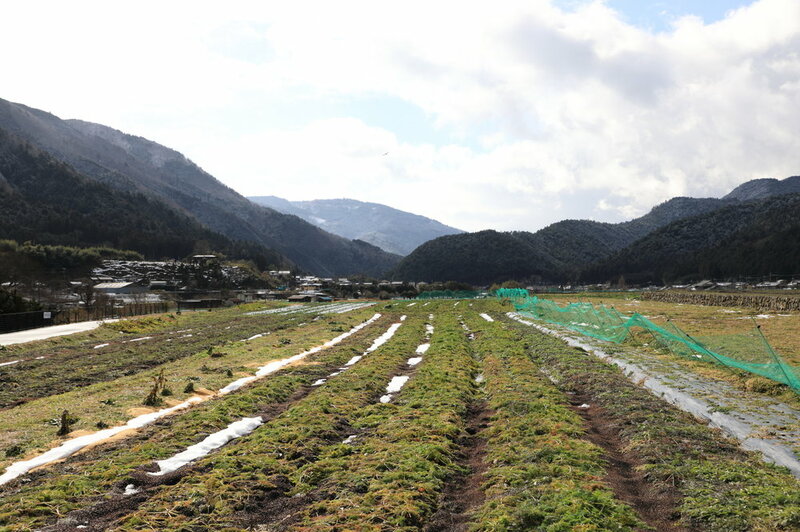 Ohara's reputation is based on vegetables, which are grown everywhere in the valley, and also the pickles that are made from them. Officially designated a kyo-yasai, or heirloom Kyoto vegetable, yellow-blooming hana-na is a member of the brassica family and is related to rapeseed and broccoli. Growing on a small family farm in Ohara in early April, hana-na's edible buds are either lightly cooked or preserved as pickles. Although most popular in autumn because of the color of its fall foliage, Ohara is an enjoyable place to visit any time of the year, including winter when dustings of snow enhance its sublime beauty. Because of its scenic beauty, tranquil isolation, and its abundance of the vegetables and pickles that are so important to Kyoto’s cuisine, Ohara became a spiritual retreat for the Imperial family ages ago. In the 8th century, Sanzen-in was founded on the eastern slopes of the valley as a monzeki, or Imperial Buddhist monastery for male members of the Imperial line. Around the same time, Jakko-in was established on the other side of valley as an amamonzeki, or Imperial Buddhist convent for women. It was to Jakko-in that the Empress Kenreimon-in fled in 1185 after losing her entire family, including her 2-year-old son, at the clan battle of Dan no Ura during which she attempted suicide but survived. Legend has it that the people of Ohara wanted to make something special for the sad and lonely 30-year-old Empress who was living in seclusion in their midst, and created shibazuke—a pickle in the purple color of the nobility—for her. The truth of this legend seems likely. In the 12th century Zen Buddhism was introduced into Japan, and the country's elite—aristocracy, Buddhist clergy, and samurai warrior class—began to follow strict vegetarian diets. Dishes made from grains and vegetables were expected to be not only substantial, satisfying, and nourishing but also complex and beautiful. Made from richly flavored, "meaty" eggplant and seasoned with two of Japan's most distinctively flavored plants, red (purple-leaved) shiso and myoga, shibazuke are pickles as culinary art. Their magnificent purple color is accompanied by a mouth-watering savory aroma, refreshing herbal bite, and satisfying chewy texture. Shibazuke are considered the greatest of Kyoto’s three great pickles (the other two being suguki and senmaizuke) because of their regal beauty, crisp taste in summer and heartiness in winter, and versatility as a stand-alone dish or as a condiment and garnish for other foods. They also have beneficial health properties, which is another reason why they have long been a fixture in the Buddhist temple pantry, and are believed to aid the circulatory and respiratory systems. At their small family farm and shop along the pilgrim’s route to Sanzen-in, the Kubo family has been making one of Kyoto's best shibazuke for nearly 100 years. Their “Shibakyu” brand means “old style shibazuke,” and the Kubos make the pickles using only the legendary recipe’s original ingredients of red shiso, myoga, and eggplant, which they ferment naturally with salt. Very importantly, the Kubos do not add cucumber to their shibazuke as many other makers do. The addition of chopped cucumbers is a recent innovation to make the pickle-making process easier and cheaper. It also dilutes the flavor of the pickles. Shibakyu’s commitment to quality and success as an artisanal food maker are due to the dedication and talent of the family's current patriarch, 73-year-old Masaru Kubo. His grandmother started the business as a street vendor selling her home-made pickles from a pushcart. When Masaru decided to take up the family business at the age of 29 it was to "preserve tradition and make good food." At the time, in the early 1970s, Japan's food culture had reached a critical juncture. The country’s post-war economic boom and intensified urbanization were driving a relentless increase in the mass production of food and an increase in processed foods. From Masaru’s perspective, the food that was available “was being made with poisons.” By making pickles in a natural and handcrafted way, he wanted to safe-guard the health of his customers as well as create a happy and meaningful life for himself. Artisanal food maker Masaru Kubo in the his shop in Ohara. 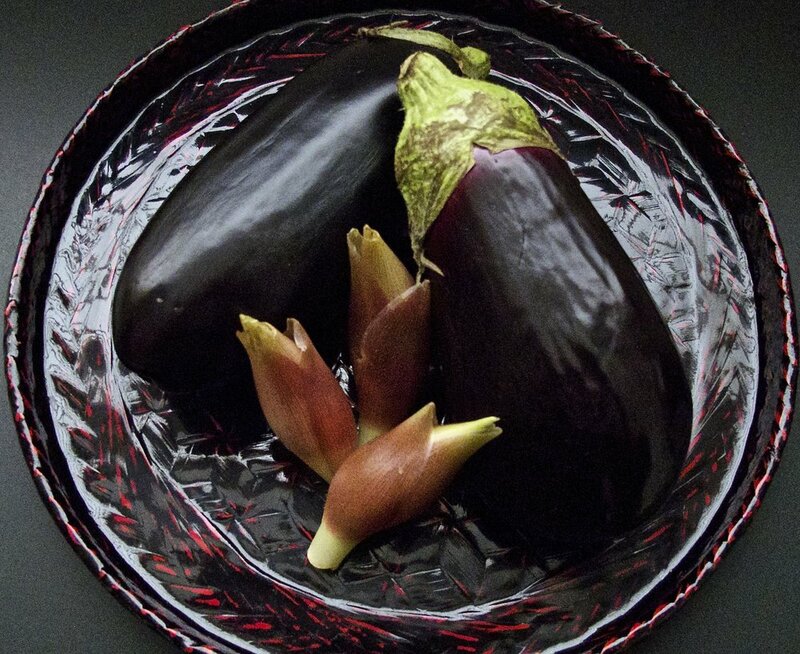 The eggplant Masaru uses as the base for his pickles is heirloom kyo-yamashina-nasu, a deep purple-skinned, gourd-shaped eggplant. They have a tender yet crunchy texture, and are the ideal medium for showcasing the coloring, aromatics, and flavorings of the red shiso and myoga, while still projecting their own character. Masaru’s skills are reflected in the remarkably chewy texture of Shibakyu’s shibazuke. It can be difficult to make eggplant-based pickles, with the challenge being to make sure the eggplant maintains a firm texture and not become mushy. Red shiso is the herb and myoga the spice of shibazuke. They are two of those Japanese foods that have their own unique, seductive, and hard-to-describe flavors. Red shiso is a member of the mint family, and has a wonderfully sunny herbal grass-like flavor with a mild mint kick. Myoga is a woodland ginger plant that thrives in the shady, watery world of Ohara's forests, and its light gingery, peppery flavor is a wonderful accent to the red shiso. Both red shiso and myoga have anti-microbial agents that aid pickling. Kyo-yamashina-nasu eggplant and the orchid-like flower buds of myoga that are used to make shibazuke. Masaru proudly showing the beautiful purple color of a tender red shiso plant in early April. Ohara is the home of the oldest, purest strain of red shiso in Japan, which is considered to have the best purple color and flavor. 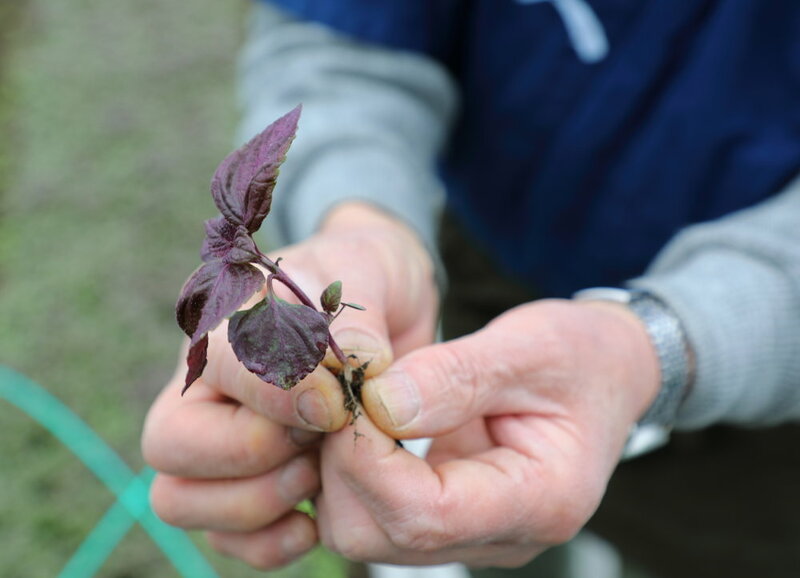 Much of Masaru's attention is focused on growing the red shiso as it is the star of shibazuke. It gives the pickles their purple color, leading flavor, and most of their health benefits. Its season determines the timing of the pickle-making process. Masaru begins the year by planting red shiso seeds in hothouses in early March. After nurturing them for two months, he moves them outdoors in May. Actual pickle-making begins when the red shiso plants reach their peak around the middle of July, which happens to coincide with Kyoto’s famous Gion Festival. Then, Masaru puts sliced eggplant, whole myoga flower buds, and red shiso leaf rubbed with salt into buckets that are weighted down with stones. The sea salt comes from the town of Ako located along the coast of the Seto Inland Sea about two hours from Kyoto in neighboring Hyogo prefecture. Ako is one of Japan's oldest salt-making areas, and its salts have been used for centuries to make Kyoto’s best pickles. It is a completely natural sea salt that incorporates the bittern left at the end of the salt-making process, increasing the salt’s minerals and anti-bacterial effects. This gives Ako salt the sharpness and minerals needed to fasten the color and bring out the flavors that make shibazuke so distinctive, while adding piquancy to the pickles and ensuring a healthy fermentation process. 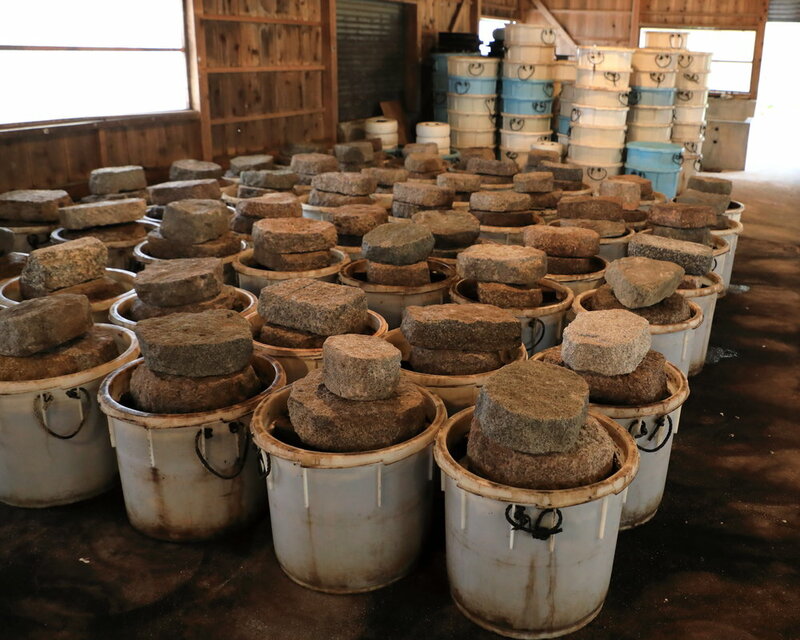 After being weighted down by stones and fermented for a month, Shibakyu's shibazuke are ready to be eaten in mid-September and can mature for up to one year in their buckets. The goal is to finish putting up the pickles by the time of Japan’s O-bon Festival in mid-August when cool autumn weather descends on Ohara and the red shiso begins to go to seed. After that, the shibazuke is left to ferment for a month, during which it undergoes an umami-enriching lactic acid fermentation. The pickles also acquire flavors from microbes in the air, and part of what makes Shibakyu's shibazuke so distinctive are the flavorful qualities of the bacteria and yeasts found in Ohara's farms, forests, and pure mountain air. The richness of Shibakyu's shibazuke's purple color is an indication of the pickle's exceptional flavor and the quality of its craftsmanship. Shibakyu's shibazuke are a dish in themselves, and can be simply eaten alongside a bowl of white rice. As a snack or main dish, Kyotoites like to eat them chopped and dressed with seasonings, such as soy sauce, and condiments, including chirimen (tiny salted sardines), jako (boiled and dried baby sardines), katsuobushi flakes (smoked shipjack tuna flakes), and sansho (a tiny peppery citrus native to Kyoto). As a side-dish, shibazuke can be used throughout a meal—as a refreshing, appetite-inducing canapé with an aperitif, a beautiful palate-cleanser between courses, or as a component of what the Japanese call the "salad," the assortment of pickles served at the end of a meal with rice and soup. Shibazuke's decorative color and flavor-enhancing saltiness, flavor-balancing sourness, and deep umami richness create endless possibilities for it as a condiment or garnish. Shibazuke are excellent on tofu, deviled eggs, grilled vegetables, clear and cream soups, and savory puddings. They are also wonderful as an ingredient in mixed green, tuna fish, and other salads, pastas, and stir-frys. Used as is or mixed with lemon or butter, they are an attractive and piquant accompaniment to seafood and meat. For maximum benefit, they work best in cold or lightly-cooked dishes, added toward the end to preserve their color, texture, and taste. 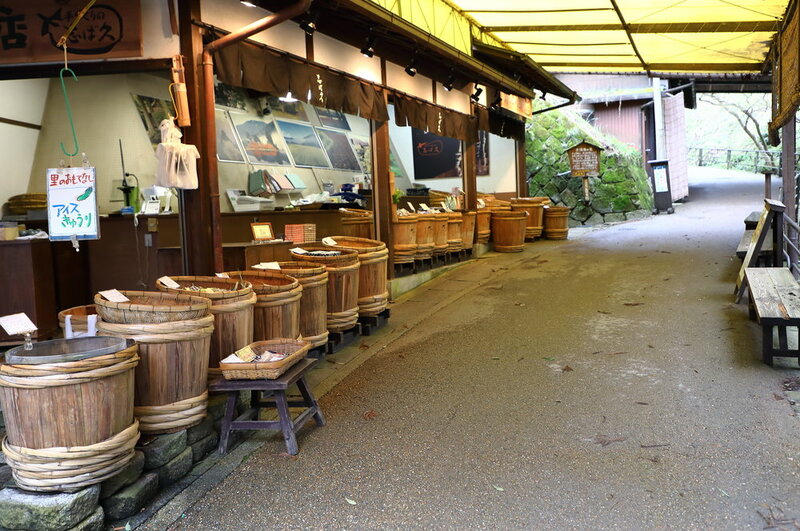 The outdoor stall of Shibakyu's main shop borders the pilgrim's route to Sanzen-in Temple in Ohara. The shop is open daily from 8:30 to 17:30. In addition to shibazuke, Shibakyu makes a variety of other seasonal pickles using Ohara's vegetables, including Kyoto's two other great pickles, suguki and senmaizuke, and a green variation on shibazuke made with cucumber and green shiso. 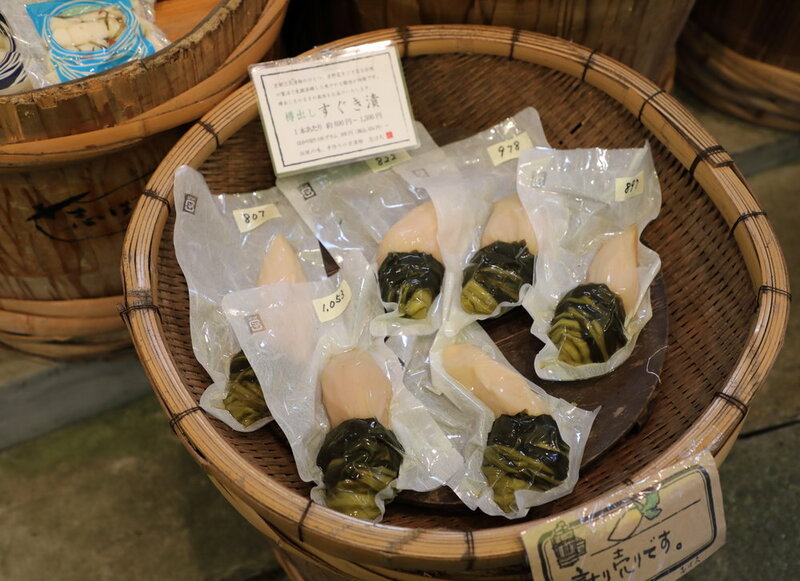 Shibakyu's shibazuke are also available in the Kyoto food section of most Mitsukoshi department stores around the country, as well as other select department stores in Kyoto, Tokyo, and Osaka. Elegant and slightly sweet hime-senmaizuke pickles, or princess senmaizuke, are Shibakyu's variation on senmaizuke. They are made from thinly-sliced long daikon radish plus konbu seaweed, red togarashi pepper, and mirin. 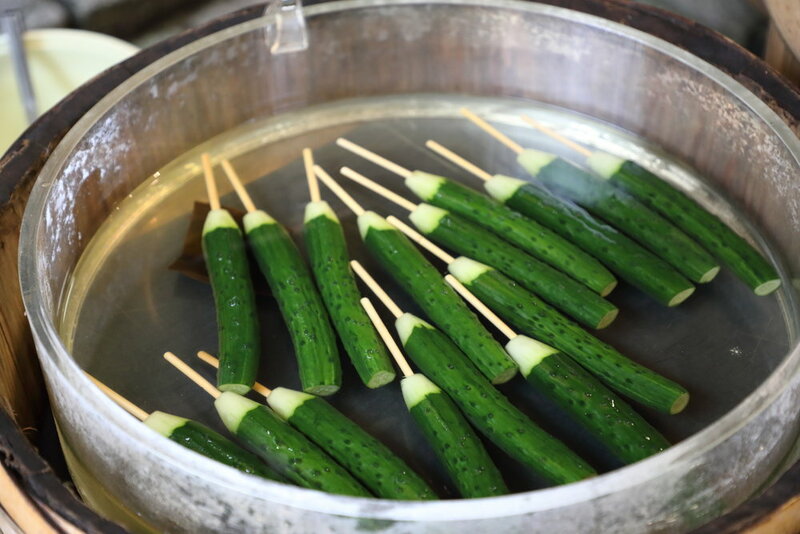 Lightly pickled in salt and iced konbu stock, Shibakyu's slender, virtually seedless, and crunchy Japanese cucumber pickles-on-a-stick are a healthy and refreshing snack even on a cool spring day. Ohara is easy to get to from a variety of locations in downtown Kyoto. By bus from Kyoto train station it takes slightly less than an hour. There are also buses from the main stations on the Karasuma subway line in central Kyoto and from key stations, like Gion-shijo and Demachiyanagi, on the Keihan Railway line in eastern Kyoto. The journey takes between 20 and 40 minutes depending on where you board the bus. Ohara offers an easy way to experience Japan's countryside and a delightful alternative to Kyoto's increasingly crowded tourist areas. In addition to Sanzen-in and Jakko-in, there are a number of other Buddhist temples and Shinto shrines scattered around the valley. The organic way these buildings blend into their natural surroundings and make use of the landscape as their "borrowed" gardens is spectacularly beautiful and gives an impression of how Kyoto's temples and shrines once integrated into the landscape before the city encroached on them. 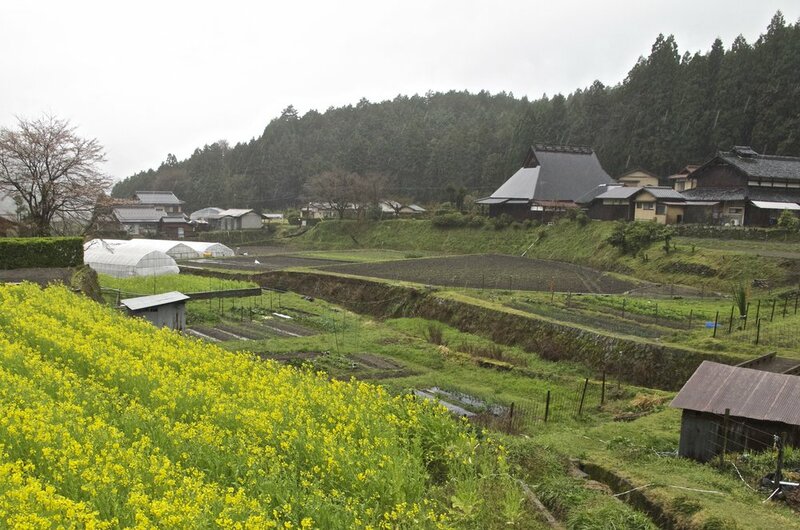 A compact and intimate valley, Ohara is easy to explore on foot or by bicycle. Wandering around the valley you will find farmers working the fields, newer residents pursuing alternative lifestyles based on craft-making, and picturesque scenes at every turn. 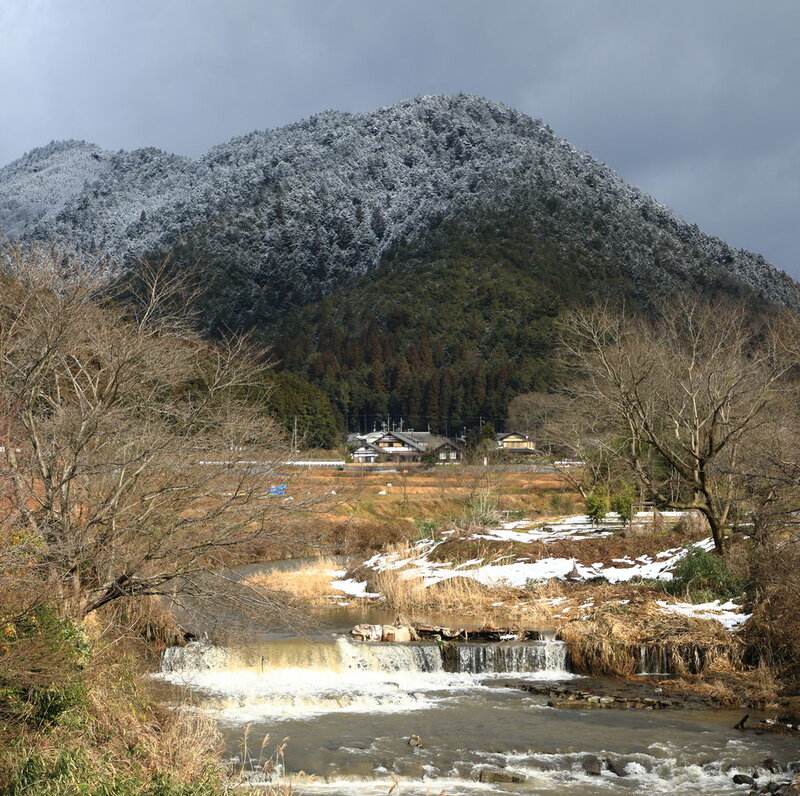 Although it is easy to visit Ohara in one day, it is a very pleasant place to spend the night, and there are several good inns with remarkable food and relaxing hot springs. Country lanes run alongside the streams and criss-cross the many hills and valleys of Ohara. The rustic maroon-stained timber and white plaster wall construction of this farmhouse is typical of buildings in Ohara. There are a variety of ways to enjoy Ohara's vegetables and pickles given that most eateries and shops feature them. In fact, Ohara's healthy vegetable-oriented cooking is one of its main attractions. Here are some of the more unique places to try. Ohara Riverside Cafe Kirin - Open every day but Tuesday from 11:30 to 16:30 for lunch or an afternoon snack, Cafe Kirin offers a delicious buffet of seasonal vegetable dishes and cakes, coffees, and ginger-based drinks. It is delightfully and conveniently located near the start of the path to Jakko-in in a renovated old farmhouse along the Takano River that flows down the center of the valley. Sato no Eki Ohara Farmers Store - This is Ohara's michi no eki, or roadside marketplace featuring all kinds of local products. It is a great place to pick up locally-grown vegetables at reasonable prices, pickles made by local farmers, and home-made bento boxes for a picnic lunch. Shino - Started 10 years ago, Shino is a small family-run business making an intriguing and delicious range of all-natural, hand-made salad dressings and other seasonings, sauces, and food items using Ohara's famous vegetables. The flavors of the salad dressings change with the seasons and have included Shitake Mushroom-Onion-Celery-Soy Sauce, Spring Scallion-Green Garlic, Yuzu-Daikon, Red Shiso, Yuzu-White Miso, and Onion-Basil, among others. 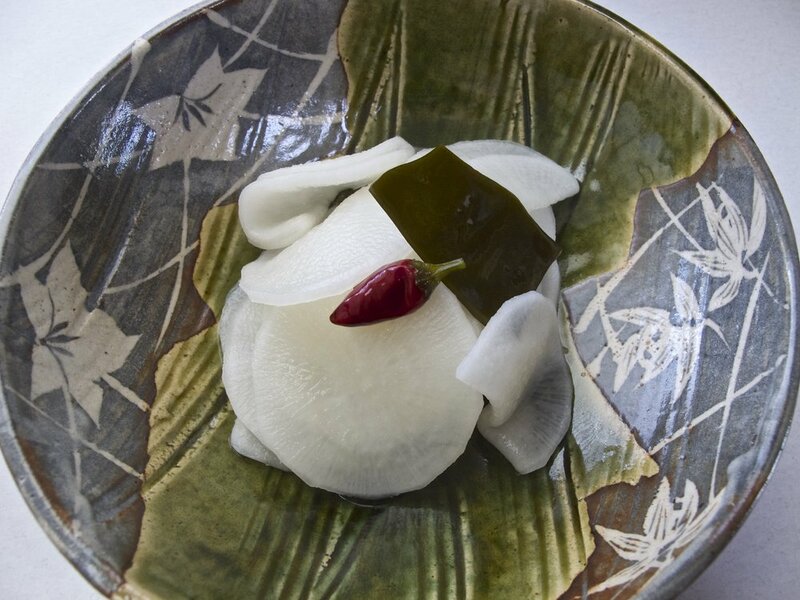 Shino is also famous for its home-made mochi, pounded rice cake desserts, stuffed with red beans or flavored with yomogi (mugwort), among other varieties. The main store and workshop is located on Route 367, which brings you into the valley. There is also a smaller shop on the path leading to Sanzen-in near Shibakyu. Shino's small shop on the path leading to Sanzen-in Temple. The Imperial Convents of Kyoto and Nara are hidden cultural treasures. They are not well known by the public, partly because most were closed in the late 19th century when Shinto was made the state religion. Until then, the convents were the homes of a long line of abbesses and nuns who were the daughters and widows of Japan's emperors and shoguns. Living in elaborate temple-garden complexes, these women preserved the traditions of the Imperial court for centuries, even as they disappeared elsewhere, while also leading monastic lives of meditation and prayer. The convents also acquired splendid collections of artwork over the years as gifts from the Imperial family. Chuguji - Open to the public on a daily basis, Chuguji was founded in Nara in the 7th century. 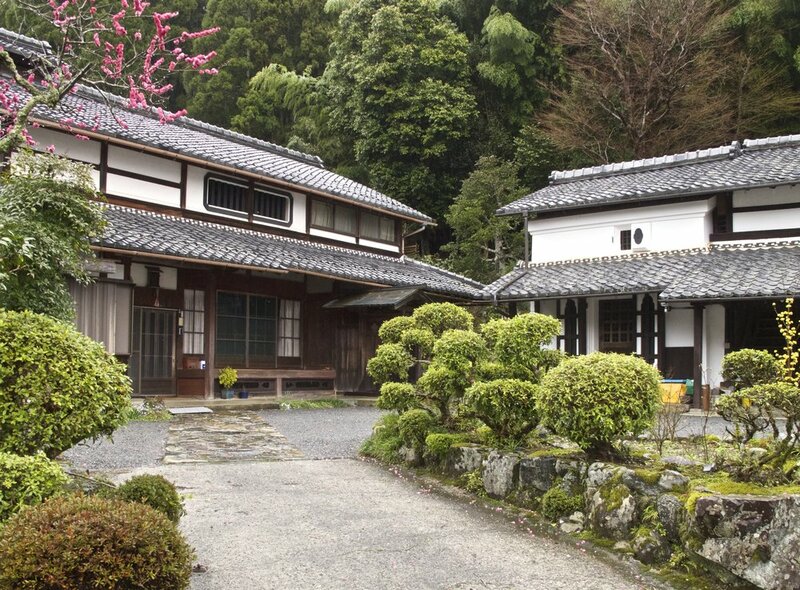 Boasting two National Treasures from the Asuka period (538-710 AD), the buildings and grounds have the naturalistic, intimate atmosphere typical of Imperial nunneries. Daishoji - Founded in the 14th century and known as "The Palace Temple" since the mid-16th century when it was ranked the highest convent by Imperial decree, Daishoji is located opposite Kyoto's Imperial Palace along Karasuma Street. The convent is not open to the public, but the memoirs of the 27th Abbess Kasanoin Jikun, "In Iris Fields: Remembrances and Poetry," provide an intimate guided tour of the refined culture during the twilight days of the convents as well as of Japan's pre-war aristocratic world. Abbess Kasanoin Jikun lived at the convent for 91 years until her death at age 96 in 2006. Hokkeji - Founded by Empress Komyo in the 8th century to serve as the head of a state-sponsored convent system, Hokkeji is a tranquil place located in a peaceful part of Nara city. There are several interesting old buildings on its ground, including an ancient bathhouse, as well as a number of works of art, including an 11-sided Kannon that has been designated a National Treasure. Hokyoji - Located in the Nishijin textile-making district of Kyoto, Hoyoji is one of the best preserved convents, but is not regularly open to the public. It holds special exhibitions of its famous collection of ancient hina and other dolls in the spring and autumn, to which the public are invited. In addition, every year on October 14 a doll memorial service called the Ningyo Kuyo is open to the public. The service is held to show respect for and soothe the spirits of old, weathered, and no longer used dolls because it is believed that dolls, like all things in the world, have a spirit. Reikanji - Located along the northern section of The Philosopher's Walk in northeastern Kyoto, Reikanji was established in 1654 for the 10th daughter of the retired Emperor Gomuzino. It houses numerous treasures of the Imperial family collected over centuries. The convent also has the only surviving residential quarters of any of the imperial convents. It is only open for the first two weeks of April and last two weeks in November when its garden is filled with cherry blossoms in spring and fiery maple leaves in autumn. Statuesque trees line the rustic stone approach to Jakko-in Imperial Convent in Ohara. The exquisite small garden at the front of Jakko-in Imperial Convent remains as it was laid out in the 12th century.